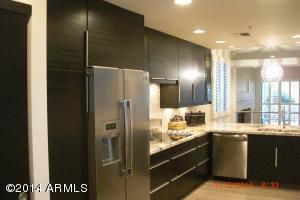 Beautifully Remodeled home in Gainey Ranch at Sunset Cove. 2 bdrm, 2 bath, 1795sf ground level unit. Design is soft contemporary, extensive use of granite, wood & steel. Professional grade stainless steel Frigidaire appliances in kitchen, Full Size Frigidaire washer & Dryer w/steam feature. Large Master Bedroom with sitting area and access to private outdoor patio. Master Bathroom is over the top; jetted soaking tub with bath/shower wand, x-large walk in shower w/bench seat, body sprays and shower wand, wrapped in frameless glass. Tons of storage in floating his and her vanity/sinks and mirrored inside and out medicine cabinets. private water closet and large walk in closet with built ins. Ceiling fans in both bedrooms and den. Wood plantation shutters on all windows for added privacy.